A wise man - probably St.Paul, possibly Bono - once noted that the Lord works in mysterious ways. In the case of a gold medallion of Jesus belonging to Los Angeles Clippers forward Lamar Odom, the mystery is this: Is the King of Kings really wearing a gem-encrusted crown of thorns? Or is He actually sporting a jewel-strewn headband, akin to those adorning Odom's more, er, earthly teammates? "It's not a sweatband," said David Lemmerman, the California-based custom jeweler who made the piece, with a laugh. "No, no. It's a crown of some kind. It has religious significance." Metaphysical considerations aside, Odom's medallion has ample worldly weight. More than half a pound's worth, to be exact. Liberally sprinkled with 765 stones, the piece is a dazzling - and somewhat blinding - reminder that in the jewelry-strewn world of professional sports, all that glitters is not gold. To the contrary, it's often white gold. Or diamonds. Or maybe rubies. Occasionally, it's all of the above - at least when it comes to a particularly ornate piece Lemmerman crafted for Milwaukee Bucks forward Anthony Mason. Checking in at more than three-quarters of a pound, Mason's medallion features his nickname and number, "Mase 14," cast in 18-karat gold and dusted with enough diamonds to sate the entire female cast of "The Bachelor." The letters "F-A-M" - Mason's term for his inner circle of friends - are inlaid in rubies among the diamonds like stoplights in a snowstorm. Along the top of the piece, a phrase cryptically reads, "If you don't know. Now you know." [Presumably, the statement refers to Mason's imposing 6-foot-8, 255-pound frame and not to the fact that wearing the hefty medallion and its accompanying half-pound chain might leave a smaller man in need of a chiropractor]. "It was such a large piece, it had to be made in eight separate parts," said Lemmerman, a jeweler for more than two decades. "When you inlay diamonds with rubies that's a very difficult piece to make. There are very few jewelers who would want that order." Fortunately for Lemmerman, there are plenty of athletes who would be happy to place it. While expensive automobiles and "MTV's Cribs" - worthy homes are still the hallmarks of the sporting good life - or conspicuous jock consumption, depending on your point of view - intricate custom jewelry is rapidly gaining ground. One finger, one earlobe and one neck at a time. "We still sell rings, bracelets, crosses and chains," Lemmerman said. "But the bigger part of our business is the custom stuff. I did one for a minor league baseball player, and it looks like Barry Bonds jerking one out. You see the muscles. You see the grain on the bat." Besides Mason, Lemmerman's company, Solitaire's, has created one-of-a-kind medallions for Washington Redskins defensive back Ifeanyi Ohalete and NBA players like Darius Miles and Baron Davis. Manhattan jeweler Jacob Arabo counts hoopsters Shaquille O'Neal and Stephon Marbury, and boxers Mike Tyson and Roy Jones Jr. as loyal customers. Los Angeles jeweler-to-the-stars Chris Aire - fittingly nicknamed "Iceman" by comedian and client Cedric the Entertainer - serves a wide range of sports and entertainment clients including actress Jada Smith, rapper Snoop Dogg, Tennessee Titans running back Eddie George and NBA players Juwan Howard and Gary Payton. The Iceman also has cometh - and soldeth goodies - to Washington Wizards guards Jerry Stackhouse, Tyronn Lue and Larry Hughes. Lue picked up a pair of platinum boxing gloves, while Stackhouse settled on a medallion featuring his initials and uniform number. In a recent catalog for Aire's company, 2 Awesome International, Hughes models diamond rings [five carats of diamonds, $22,000] on his right and left pinky fingers. An iced-out watch [19 carats, $180,000] sits on his left wrist. A rope [20 carats, $50,000] and pendant [15 carats, $65,000] combination dangles from his neck. On Hughes' right wrist, however, rests the real piece de resistance: a gem-littered bracelet [34 carats, $150,000] so squint-inducingly bright it wouldn't be out of place in a museum. Or King Tut's tomb, for that matter. "Just about every piece of jewelry Larry wears, I think we made for him," Aire said. "I think what it is that you have people who are fashion conscious. They like the nice things in life. And money is really no object." Arabo, whose annual revenue is roughly $20million, reportedly sold Marbury a $250,000 bracelet that contained 130 carats of diamonds. Lemmerman said his prices range from $1,500 for a gold dog tag to more than $100,000 for bigger, more detailed pieces. Hughes, who signed a 3-year, $15million deal with the Wizards this past summer, declined to put a dollar amount on his jewelry collection. But he freely admits that it's an "expensive" hobby. "It's a personal thing" said Hughes, who bought his first big ticket item, a watch, in 1999. "I like the shine. I have a chain with my signature, and it's nice to have something that's original, something that you don't see everybody with." When Tiffany's fails to suffice - too plain, too ordinary, too, well, pedestrian - it's up to jewelry makers like Aire to fill the void. In Aire's catalog, George's Egyptian-themed cross looks different than Hughes' more traditional model, and different still from the one draped over Dallas Mavericks guard Michael Finley. Working off a tattoo shared by New Orleans' Davis and his friends, Lemmerman created an elaborate medallion that depicts a pair of clasped hands. Aire brought in mechanical engineers to build Payton a working lock and key made entirely of diamonds and platinum. "Say you meet a guy who's got a piece on and everybody is admiring it," Aire said. "Now, you want to get your own piece, too. But you don't want yours to be just like the other guy's, so you might want to jack it up just a little bit more. If your friend drops 21, you want to go out there and drop 25. Twenty's been done." Making jewelry that would stand out at Buckingham Palace isn't easy. For Mason's medallion, Lemmerman began with a series of concept sketches - running each one by the Bucks forward - before sculpting a wax model. The model was used to create a series of moldings, which were then filled with liquid gold. Once the gold hardened, parts of Mason's medallion were sent to three different diamond setters - each specializing in a particular gem pattern - and then returned to Lemmerman for final assembly. Total production time? Nearly two months. "And the minute a guy decides they want their two initials done, the first question out of their mouth is, 'How quickly can you have it done?'" Lemmerman said with a laugh. Tell that to Aire. When Philadelphia 76ers guard Allen Iverson - whose rap nickname, ironically, is "Jewelz" - asked the jeweler to make the rings for Iverson's summer wedding, Aire had less than a week to complete the job. Working around the clock, Aire and his 20-person staff cut more than 50 stones, all of which were set in hand-crafted mountings. Iverson's ring alone sported roughly 14 carats of diamonds. "It was a big challenge to have that ready for his wedding," Aire said. "But we finished it." A jeweler's work doesn't stop there. If a piece is damaged or scuffed, the owner can mail it to Lemmerman and often get it back - in pristine condition - the very next day. When an athlete like Miles comes through the L.A. area, Lemmerman will even meet him at his team hotel, the better to clean and return scuffed pieces before the tip-off of an evening game. "Working with Dave, if you have stuff customized, he flies it out to you," Ohalete said. "He caters to the athlete. That's a big thing, 'cause some of us are lazy." Not surprisingly, sports jewelers often enjoy close relationships with their customers. Arabo reportedly was a guest at birthday party for New York Yankees shortstop Derek Jeter and a private party at Marbury's New Jersey home. Aire considers Payton a close friend and said the Seattle guard was a driving force behind the launch of his company in 1996. When the Toronto Raptors were attempting to re-sign free agent Tracy McGrady, team officials didn't just wine-and-dine the explosive shooting guard, they also feted his Florida-based jeweler, Brents Bullock. Lemmerman has been friends with Wizards swingman Bryon Russell for more than a decade. And Lemmerman's daughter, Danielle, went to high school with Ohalete, who occasionally plays golf with the jeweler. "It's real important for me to have a great relationship with [athletes] and be available," Lemmerman said. "They aren't experts in jewelry, so they have to take you at your word. "A lot of times I'll meet an agent or a money manager and they're like, 'Ugh, a jeweler, what the [heck] am I talking to you for?' But the fact is that a good percentage of the kids in the NBA are going to get some jewelry for themselves, their mothers, their wives. They need an honest jeweler." Scam artists aren't an athlete's only concern. Last year three gunmen doused New York Giants cornerback Will Allen with gasoline and threatened to set him on fire before stealing $150,000 worth of jewelry, including a 51-carat platinum-and-diamond bracelet. Oakland linebacker Bill Romanowski once had a carry-on bag with $250,000 in jewelry swiped from him at Miami International Airport. Among NBA players, New Jersey's Chris Childs recently was held up for $30,000 worth of jewelry and cash; Chicago's Jalen Rose had $250,000 worth stolen from his locker at Milwaukee's Bradley Center; Boston's Antoine Walker lost a $55,000 watch to a trio of thieves; and Payton once was robbed at gunpoint of $60,000 worth in an Oakland parking lot. Two years ago, Marbury had a $150,000 piece ripped from his neck - literally - when a robber reached through the open window of his Bentley. "I basically know when and where to wear my stuff," Hughes said. "If I'm going to be doing a lot of moving, getting into and out of cars, going in and out of places, I won't wear it, or I'll wear just the watch or bracelet. I never go out with everything on. That's just looking for trouble." Of course, not all losses are quite so harrowing. While sliding headfirst into a base during a minor league rehab assignment this summer, Boston Red Sox slugger Manny Ramirez lost a $15,000 diamond earring in the infield dirt. Between innings, Ramirez reportedly got on his hands and knees to search for the earring, holding up the game for several minutes. A handful of groundskeepers also joined the hunt, which ultimately came up empty. "Don't worry about it," Ramirez said afterward, noting his eight-year, $160million contract. "I've got money. I can buy another one." A similar attitude seems to be behind Aire's latest creation, the Traveler watch. Nearly big enough to double as a wall clock, the Traveler costs between $6,500 and $125,000 and can be festooned with more than six carats of diamonds. According to a recent magazine article, actor Will Smith, rapper Jay-Z and NBA players Payton, Iverson and Kevin Garnett are all on Aire's waiting list. "And it's not just the NBA guys," Aire said. "It's a trend. Movie producers, directors, actors - they're all looking for it. Even the girls are buying the huge watches." For his part, Lemmerman hopes to add working lights and moving parts to his jewelry. By next year, he said, he expects to construct a medallion with a fully functional basketball and hoop. "A player could have a remote control in his pocket," Lemmerman said. "They press a button, and there's a windmill dunk. It's like a Disneyland thing, but on a small scale. And it's all ice. That's definitely the next level." In the meantime, fashion-forward athletes will have to settle for the newest trend in high-end jewelry, the aptly named red gold. Stackhouse recently ordered a pair of red gold dog tags, and in the words of the 2 Awesome International catalog, the crimson-hued metal is "the hands down choice for the new millennium." Especially when it's paired with diamonds. Or platinum. Or both. "Red gold is still a product that's a couple of months away," Hughes said. "But with Christmas coming up, I think it will be hot this winter." And that, in a way, brings us back to Jesus [the Nazarene carpenter, not the Odom medallion]. 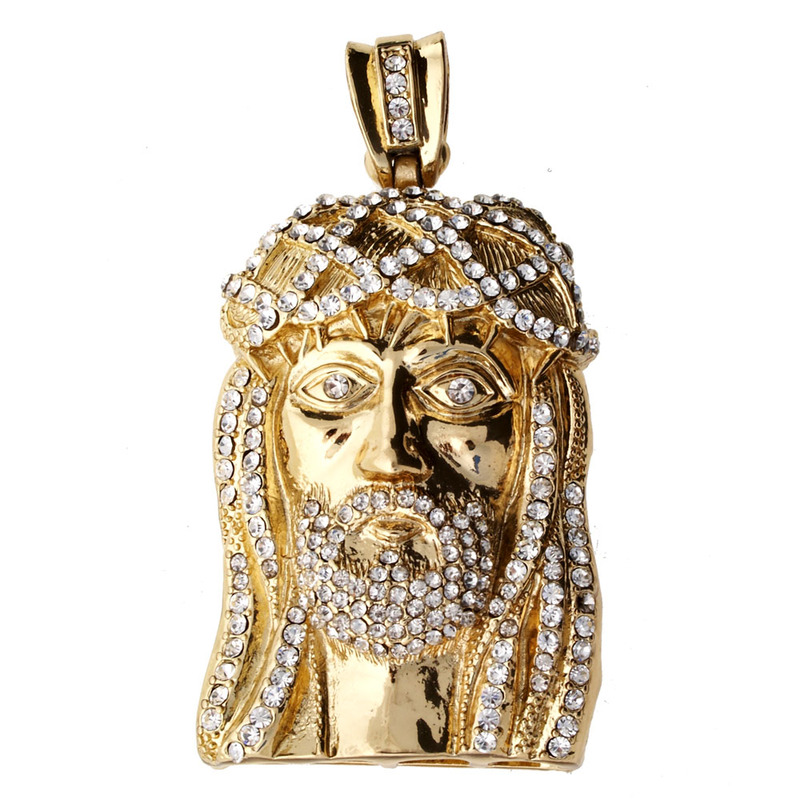 In the Bible - again, the King James version, not the platinum-and-diamond pendant made by Aire - the Prince of Peace rails against the Scribes and the Pharisees, the fools and the blind, asking which is greater, "the gold, or the temple that sanctifieth the gold?" The answer, of course, is the temple. Unless you're talking about red gold. In which case, it may be a push.